The term “discovery” can be defined as “the act of becoming aware of something previously existing but unknown.” There are many kinds of discoveries from geographical to mathematical ones. Roughly speaking, we can classify discoveries into two types: the factual discovery and the conceptual one. In the historical development of scientific inquiry, the former typically occurs during the period of “normal science” in Kuhnian term. The latter emerges in the opportunity of “scientific revolution,” i.e., the time of a paradigm-shift. It is necessary for scientific discoveries to use imagination as well as reasoning. Based on the study of aphasic disturbances from a viewpoint of using figurative expressions by Roman Jakobson, we would like to discriminate between the metonymical imagination from the metaphorical one. While the former is related to discoveries of facts and laws which complete an unfinished theory, the latter is concerned with conceptual discoveries which change a viewpoint from explicit facts to implicit unknown relations. Considering these points, it is useful to examine Poincaré’s description of his own experience concerning mathematical discovery. He emphasized the working of “the subliminal ego” and “the aesthetic sensibility” in his discovery of Fuchsian function. These activities can be compared to the function of metaphorical imagination. However, it is not easy to formulate the unconscious process of “aspect-dawning” in the form of explicit rules or algorithm. 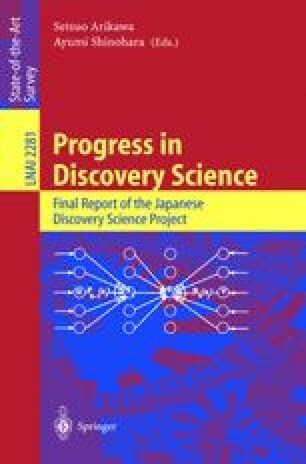 This suggests the difficulty in realizing scientific discovery by computers.